Cascading Drop-downs in a SharePoint Custom Task Form | Are you a user? 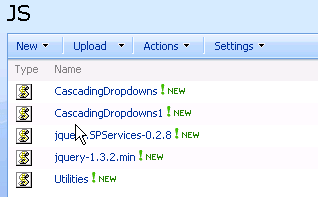 Then you need to get a copy of the SPServices jQuery library and upload it. It is out on CodePlex here. It is important to note that I’ve found that the order in which the libraries are referenced is important! So important that, if they are reversed, you’ll likely get an “‘SPServices’ is null or not an object” error. This was plaguing me for several hours. Here’s a picture. Click on it to make it bigger. Again, a picture of the code. The relationshipWebURL can be left blank as long as the relationshipList is in your site. Otherwise, specify the URL of the site that has the relationship list. The relationship list is a simple list with two columns that indicates what the allowable values are (column2) for each value in column1. So, if you a relationship of Country/State, you’d have to list a country many times (50 for the U.S.) and enter a unique state on each line. If you had two countries (U.S. and Canada), each time a country is selected in the primary drop-down list, the secondary drop-down would populate with the list of states (or provinces) valid for the selected country. The relationshipListParentColumn is the internal name of the primary or first column in the relationship list. The internal name can vary greatly from the displayed name. Usually, if you put spaces in a column name, you’ll find the spaces are replaced by _X0020_, but you also have to be careful about other liberties that SharePoint takes when creating internal field names. 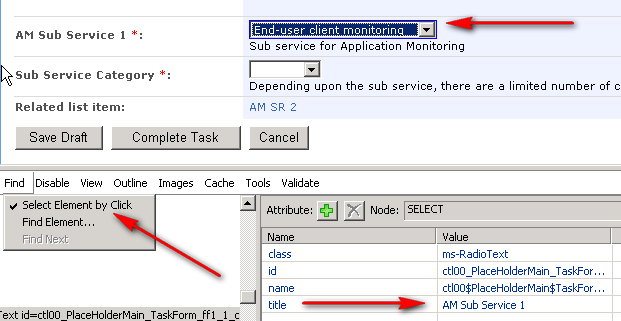 To view the internal field name, go to the list settings and click on the column name. You can look at the end of the URL and see the internal field name where it says &Field=XXXX. Here’s an example. You’ll also see the underscores and other “unsafe” characters have been URL-encoded. %5F is the encoded version of the underscore (_) character. 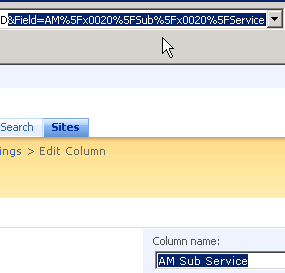 So, AM Sub Service becomes AM_x0020_Sub_x0020_Service. The relationshipListChildColumn is the column that will change and be filtered based on the selection of the parent column. Similar to the parent column, you need to specify the internal field name for this column. The parentColumn is the display name of the parent drop-down list on the form. You can find this in the form in code view in SPD. This corresponds to the title of the control. If you use the IE developer toolbar (for IE7 or prior versions), or use the built-in developer tools in IE8 (F12), you can find the properties of the control, including the title. Here’s IE7 with the “Find by Click” function enabled in the developer toolbar. You can also look in the code view in SPD and find the <datafields> tag. Here you’ll see a listing of all the data fields’ internal and friendly names. 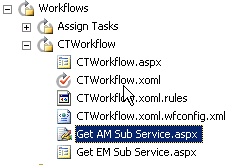 Here you can see AM_x0020_Sub_x0020_Service_x0020 and AM Sub Service 1. I’m not really sure where the ending “1” went on the internal name…must be a SharePoint weirdness. The childColumn is similar to the parentColumn except it’s the one that get populated based on the selection of the parent column. You need to specify its friendly name or title. Again, looking at the <datafields> tag you can see Sub_x0020_Service_x0020_Category and Sub Service Category as the internal and friendly field names. 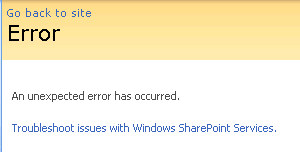 My problem was I was receiving a “‘SPServices’ is null or not an object” error whenever I tried to use the code. Here’s what the debugger was showing from within the executing code. It turns out that the problem was resolved by changing the order of the script references as stated previously in this post. Now, on to the fun stuff. 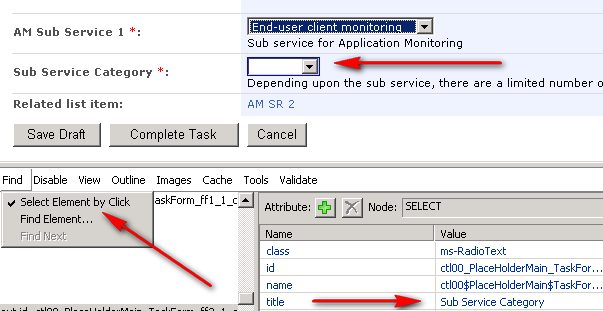 Here we are, in a SPD workflow using the “Collect Data From a User” action. This action creates a custom task form that is used to “collect” (imagine that) data from a user when the workflow creates a task and pauses for task completion. We want to use the cascading fields within the custom task form. Within the workflow I’ve opened up the custom task form that was created by the action in the workflow. It is within the PlaceHolderMain area I’ve strategically placed the code that will control the drop-down lists. Executing the Edit task function which uses the custom task form, you can see that I have success! Hi Russell, I am using the same thing in my project and getting the error “unexpected error has occured” while trying to submit the list values. Did you find a solution for this? Please let me know. Thank you. Not yet. I might get back to this after the SharePoint conference in Vegas. This was a great help to me, thank you very much. I went through your instructions twice. I am running in to an error not seen others post. I am tring this out on a simple project first. all lists are on the same site. I put the jquery in a document library with in the same site as the lists. my two lists are states and cities. I renamed title to states in both lists. Hello, I already know this code and it work with Default form Fields, My problem is when in sharepoint designer i Delete a form field and Insert a Sharepoint Dropdown List. The DropDownList not have the property “title” and the java script need this property to indentify the parentColumn and the child. I tried to put this property in the dropdown list, and it works, now it filters but now it not save the value in the list….. Anyone know what to do??? I am using the same thing in my project and getting the error “unexpected error has occured” while trying to submit the list values. Did you find a solution for this? Please let me know. Thank you.